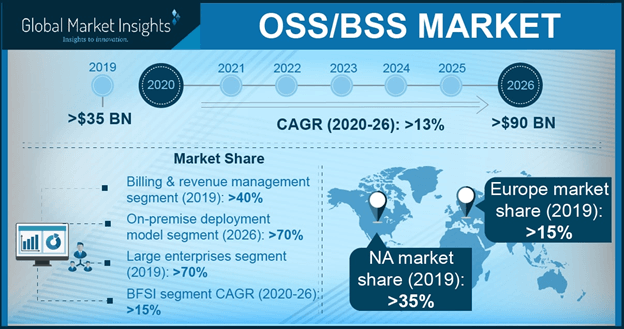 OSS/BSS Market size crossed USD 30 billion in 2017, growing at a CAGR of over 7% from 2018 to 2024. The OSS/BSS market is projected to exhibit a lucrative growth between 2018 and 2024 due to the increasing awareness regarding enhancing service assurance in the telecommunication sector, the growing demand for lowering operational expenditure (OPEX), and the increasing popularity of convergent billing systems. Communication Service Providers (CSPs) need to reduce network OPEX to maximize the revenue from new services. Small & medium telecom operators are increasingly benefiting from OSS/BSS delivered over the cloud. Such cloud-based services provide them an excellent combination of flexibility and technology to realize business optimization at a fraction of the costs incurred on procuring and implementing traditional licensed software. The SMEs can achieve the same level of business maturity as large telecom companies while ensuring reduced operational expenses and less financial risks by using cloud-based OSS/BSS solutions. OSS solutions accounted for a majority share of over 50% in 2017 in the OSS/BSS market and are expected to maintain the market dominance throughout the forecast period due to the growing trend among telecom service providers for outsourcing their operational business functions to third parties offering specialized business services. With a rapidly evolving technological landscape leading to changing customer demands for innovative services, the demand for advanced OSS solutions is likely to increase consistently between 2018 and 2024. The service assurance segment in OSS/BSS market is projected to exhibit excellent growth with a CAGR of over 7% between 2018 and 2024. The service assurance allows enterprises to detect faults in the network and resolve issues aptly to reduce the service downtime. It also enables the enterprises to effectively identify, diagnose, and address device malfunction and service quality degradation issues without impacting the customer experience. As CSPs are increasingly focusing on enhancing the customer experience and retaining existing customers, the demand for service assurance applications is expected to grow steadily during the forecast period. The cloud OSS/BSS market is projected to register an accelerated growth with a CAGR of over 9% during the forecast period. Intense competition, cost pressure, and demand for innovative services are forcing CSPs to adopt alternative delivery models. Cloud computing significantly reduces the software and hardware requirements of networks and platforms. Cloud allows the operators to provide an infrastructure on demand and scale computing capacity accordingly. The cloud model also offers flexible configuration and re-usability that simplify the process of launching a new service. Moreover, the model also enables organizations to streamline their business process. The large organizations held a dominant share of over 70% in the OSS/BSS market in 2017 due to the widespread adoption of the solutions among large telecom service providers and financial institutions. These enterprises leverage on the capabilities of the OSS & BSS for the management of business performance, end-to-end delivery of the services, and for providing enhanced user experience to their customers. However, the SMEs market is projected to register an excellent growth throughout the forecast period due to the growing popularity of cloud-based OSS/BSS solutions benefitting from the flexible payment models offered by cloud service providers to save significant capital expenditure on procuring and upgrading dedicated hardware resources. The IT & Telecom sector dominated the OSS/BSS market in 2017 with a market share of over 75%. The significant market share is attributed to the increasing demand for the next-generation OSS & BSS solutions for flexibility, scalability, and open network architecture. As telecom service providers are increasingly migrating from classic OSS/BSS systems to next-generation OSS/BSS to incorporate newer service models, the adoption of the technology in the sector is anticipated to remain steady throughout the forecast period. The Asia Pacific OSS/BSS market is expected to register a lucrative growth between 2018 and 2024 while registering a CAGR of over 10%. The excellent growth is attributed to a rapidly growing telecommunications infrastructure in the region, especially in China and India, along with the growing penetration of smartphones leading to an increase in the consumption of mobile broadband services. With significant investments being made in these countries for the commercialization of 5G networks, the demand for modern OSS/BSS solutions by CSPs will increase rapidly throughout the forecast period for delivering an enhanced user experience to the customers. The competition in the OSS/BSS market is characterized by strategic collaborations and partnerships among the CSPs and the OSS/BSS software solution providers for delivering comprehensive product offerings to the customers. For instance, in November 2017, Eastern Communications, a leading enterprise communication service provider in the Philippines, and Tata Consultancy Services, one of the leading global IT service providers, entered into a partnership. Under the partnership, TCS HOBS, the company’s next-generation platform for subscription-based digital businesses was implemented by Eastern Communications to modernize its legacy billing system. Similarly, in October 2014, Ericsson formed a global OSS/BSS partnership with TIBCO Software, wherein TIBCO middleware was included in an extensive portfolio of OSS/BSS software along with consulting and systems integration services offered by Ericsson. Some of the key players operating in the OSS/BSS market are Accenture, Agile Network Systems, BMC, Amdocs, CA Technologies, Cisco, Comarch, CSG Systems, Ericsson, HPE, Huawei, IBM, Infosys, Netcracker, Nokia, Oracle, Redknee, Subex Limited, Tata Consultancy Services (TCS), and Tech Mahindra. Traditionally, OSS integration involved various software developed for a specific application. To bring standardization to OSS integration, the ITU-T developed the Telecommunications Management Network (TMN) series of standards in 1988. This series of standards provided the four logical layers of network management including Business Management Layer (BML), Service Management Layer (SML), Network Management Layer (NML), and Element Management Layer (EML). From 2000, the next-generation of OSS and BSS platforms were implemented to monitor network resource usage in real-time and to improve traditional OSS with a modern and highly agile approach to the network management systems.